← Have you ever wondered what “SSG” means? 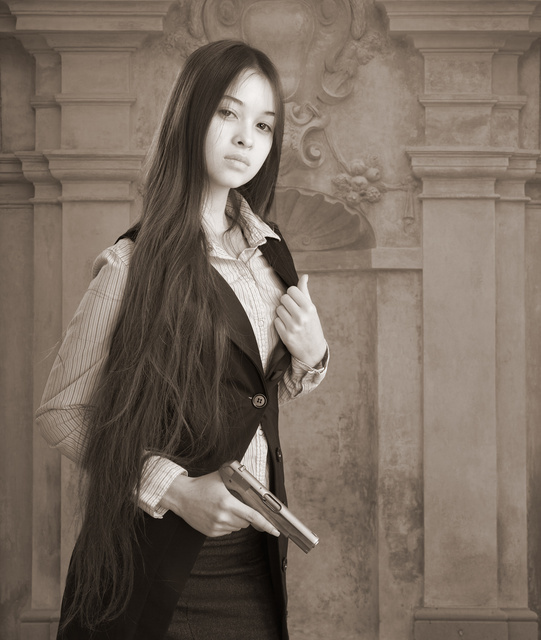 This entry was posted in interesting people, pistol and tagged 380ACP, Colt, girl, hair, long, pretty. Bookmark the permalink. is that hair all her? great googly moogly! That being said I’ve always preferred women with long hair. ha ha! all should know every little girl has a po’ed daddy close by to take care of bid’ness! Not really. The best girls don’t have to rely on daddies for taking care of things. The best girls usually had a Daddy to make sure they knew how to take care of themselves! then you raised her right. Congrats. Sigh I wish my friends were raising their two little girls that way. As it is..it’s probably gonna have to be ME that does the scaring [as my duly appointed role as beloved but homicidal uncle] and the killin and burying in the same role; when they start dating. The apple doesn’t fall too far from the tree. She’d have a good career in the “Film Noir” genre . Or even in a Bond film.